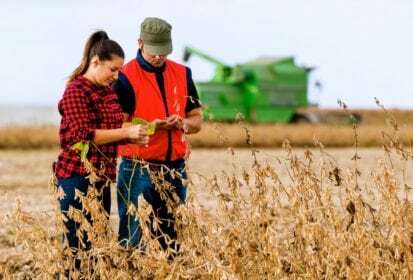 For two-thirds of soybean producers in Saskatchewan last year, it was their first time growing the crop, with seeded acres up to 850,000 from just 239,939 in 2016. In Manitoba, soybean acreage jumped from over a million and a half acres to well over two million acres in 2017. Estimated acreage is lower this year in both provinces, but many producers may still be new to soybeans. Here are a few pro tips to keep in mind during the harvest season. Mark Sloane, a DuPont Pioneer seed dealer and agronomy consultant based in Clearwater, Man., says producers new to soybeans should start with ground prep the previous year. Soybeans dry down really well on their own, so a desiccant is not necessary, according to Glenda Clezy, agronomy specialist for Saskatchewan Pulse Growers. Some Saskatchewan producers used to doing a pre-harvest dry-down application did desiccate their beans last year, she says. But it’s only necessary to desiccate if producers have a lot of weed pressure and they want to manage them prior to harvest. According to Clezy, there’s a narrow harvest window when soybeans aren’t too wet or too dry — and producers can’t always judge moisture content by colour. Soybeans can dry down very quickly. For producers with more acres, harvest can start at around 16 per cent moisture. “If you have more acres, if you start at 13 to 14 per cent, by the time you finish your last fields will be highly susceptible to mechanical damage,” says Clezy. If soybean moisture is above 13 per cent at harvest, beans should be conditioned to bring moisture down prior to storage. “We recommend direct combining with a flex header instead of swathing,” says Cassandra Tkachuk, production specialist for Manitoba Pulse and Soybean Growers. Losses will be too high if producers try to put the beans on the ground first and then combine, she says. Clezy says most producers have got the message about straight-combining soybeans, but a few first-time producers in Saskatchewan did swath in 2017. According to the SaskPulse website (www.saskpulse.com), soybeans can be swathed, but the crop shouldn’t be left in the swath too long because it’s easily damaged by rain. Producers who do choose to swath should combine the crop immediately to avoid a drop in quality, and the straw should be mature to reduce the number of pods in the sample. The Manitoba Pulse & Soybean Growers worked with the Prairie Agriculture Machinery Institute to come up with ways of minimizing losses during harvest. What PAMI found was that at combine speeds of two to four miles per hour, losses were minimal, but loss rates jumped up at five miles per hour. Just four beans per square foot equals one bushel per acre of harvest losses, says Tkachuk, and ideally losses should be less than five per cent of total yield. Because 80 per cent of losses occur at the header, MPSG has created an app called a soybean harvest loss assessor, available on its website, www.manitobapulse.ca, that offers a description of the different types of header losses. “Soybeans are easy to combine, they’re easy to go through fast, but if you’re going to do that make sure you’re checking your losses,” warns Clezy. Sloane recommends setting your GPS on an angle with your seeding or planting rows to keep beans moving across the knife and feeding onto the header more uniformly, especially if you get into some shorter beans. Tkachuk says producers should adjust cylinder speed and concave clearance to minimize cracking and splitting of the seed. She says PAMI also recommends using an air rail to minimize losses. Sloane cautions that air bars are nice when beans are shorter but can push more dirt into the combine. When growing a new-to-you crop, knowledge is power. Both SaskPulse and MPSG host up-to-date production resources on their websites. But Clezy also says if producers are growing soybeans for the first or second year, they should talk to neighbours who have more experience growing the crop.